At the end of a long time spent working hard in the labs, this week, scientists from the Graphene Flagship are gearing up for conducting two experiments for investigating the use of graphene technologies for space-related applications in partnership with the European Space Agency (ESA). Two teams of researchers will explore the benefits of graphene as a light-propulsion material in solar sails, and as a smart coating in loop heat pipes for satellites. Both experiments will be performed in microgravity conditions, to simulate the extreme conditions in space. The solar sails will float in microgravity in a drop tower experiment, while the research team investigating heat pipes will experience weightlessness onboard a parabolic flight. CREDIT: The Graphene Flagship. 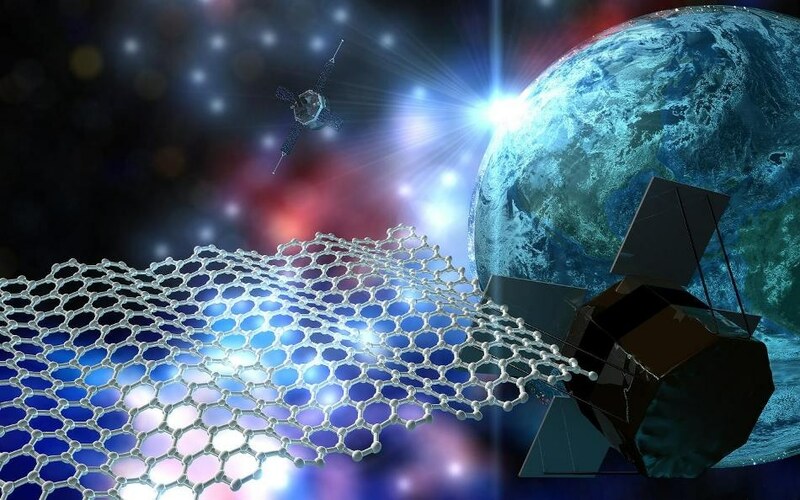 Two research teams will investigate the advantages of using graphene as a light-propulsion material in solar sails, and also using graphene as a smart coating in loop heat pipes in satellites. In order to reproduce the severe conditions in space, the experiments will be carried out under microgravity conditions. The solar sails will be made to float under microgravity in a drop tower experiment, and the team that tests the heat pipes will encounter weightlessness on a parabolic flight. The Graphene Flagship is a pan-European research consortium devoted to transform graphene technologies to fully developed applications through research laboratories. Graphene (a single-atom-thick carbon sheet) is propitious for use in a wide array of applications due to its exceptional mechanical, electrical and thermal characteristics. At present, these characteristics will be investigated in severe microgravity conditions, thus increasing the ability for using graphene in innovative ways. Loop heat pipes that are largely used in satellites and other aerospace applications are cooling systems. Cooling is accomplished by transforming a working liquid into gas inside a wick, thereby extracting energy from the hot instrument that has to be cooled. Subsequent to positive outcomes of the study, a research team from the Graphene Flagship endeavors to show that using graphene to coat the wicks can enhance the efficiency of the heat pipe even under microgravity conditions. In order to investigate the graphene-coated wicks under microgravity conditions, the scientists will participate in a low-gravity parabolic flight conducted by ESA in collaboration with Novespace. Microgravity is reproduced in the flight by carrying out a sequence of parabolic maneuvers, thus enabling the researchers to experience weightlessness. I’m really excited, I’ve never done anything like this before. Getting to see these materials that we’ve been working on for so long, finally work in the conditions that we want them to is really exciting. The experiment is a partnership between Graphene Flagship partners at the Microgravity Research Centre, Université libre de Bruxelles, Belgium; the Cambridge Graphene Centre, University of Cambridge, UK; Institute for Organic Synthesis and Photoreactivity and Institute for Microelectronics and Microsystems, National Research Council of Italy (CNR), Italy; and Leonardo Spa, Italy, a global leader in aerospace, operating in space systems and high-tech instrument manufacturing and in the management of launch and in-orbit services and satellite services. We are happy to take part in the experiment and test the use of graphene for satellite loop heap pipes for the first time. Mastering emerging technologies like graphene, and using them to develop of cutting-edge products is of prime importance for a company like Leonardo, which bases its competitiveness on innovation. Light sails use pressure from light irradiated on a reflective surface to propel objects in space. GrapheneX, a group including PhD students from Delft Technical University (TU Delft), Netherlands, has devised an experiment to investigate the possibility of using graphene in light propulsion, by irradiating laser light on free-floating graphene membranes under microgravity conditions. The TU Delft Space Institute, Netherlands, is also supporting to the GrapheneX project. If you want to make a solar sail it’s very important that the materials you make the sail out of is very light. The ultimate lightness and the strength are really the main advantages of using graphene. The experiment will be conducted at the ZARM Drop Tower in Bremen, Germany, as part of ESA Education’s Drop Your Thesis! program, which encourages students to contribute concepts for conducting microgravity experiments. In order to reproduce severe microgravity conditions, down to one-millionth of the gravitational force of Earth, a capsule including the experimental setup is propelled up and down the 146-m tower, resulting in 9.3 seconds of weightlessness. “Facilities like the ZARM Drop Tower are something impressive, in the scale they are and the number of things that have to work together to be able to function properly. I’m very honored to go there,” stated Rocco Gaudenzi (TU Delft), another PhD student who is also involved in the GrapheneX team. The two ambitious experiments are an exceptional display of the manifold potential of graphene, and will prepare the base work for increasing the boundaries of graphene studies.